iTunes’ AirTunes feature lets you stream iTunes’ audio over your network to an AirPort Express Base Station—or, recently, to an Apple TV—allowing you to listen to your music through any audio system connected to the remote device. Since Apple first introduced this feature, Rogue Amoeba has been enhancing it, engaging Apple, so it would seem, in a game of one-upsmanship—if you add a feature, we’ll add an even better one. The biggest drawback of AirTunes has always been that it works only with iTunes audio. You couldn’t use the feature to listen to audio from another program—for example, QuickTime or a pro-audio app—or audio playing in a Web browser. The original version of Airfoil, which I reviewed back in 2005, removed this limitation, letting you stream audio from any single application directly to a single AirPort Express. In January 2006, Apple improved AirTunes significantly by allowing you to send audio to multiple AirPort Express units simultaneously. But audio was still limited to whatever was playing in iTunes. Airfoil 2, which I covered in March 2006, was Rogue Amoeba’s answer. It allowed you to send any audio to multiple AirPort Express units, keeping the audio in sync between them. (Version 2 also added a number of other useful features.) So with enough AirPort Express units, you could fill your house with any audio your Mac could play, whether that audio originated in iTunes, QuickTime Player, DVD Player, a Web browser, or, come Mac OS X 10.4, a Dashboard widget or Front Row. You could even “broadcast” audio from an external source connected to your Mac’s audio input(s). The recently-released Airfoil 3.1 helps Rogue Amoeba keep up with the Joneses (or the Jobses, if you will) by letting you send audio from any source to an Apple TV. (This feature debuted for AirTunes with the recent “Take Two” version of the Apple TV software.) But Airfoil 3 also adds several unique features of its own. As with previous versions of Airfoil, sending your audio to remote “receivers” is simple. You launch AirTunes, choose the audio source—a particular program or widget, a specific audio input, or all your Mac’s audio at once—from Airfoil’s source-selection pop-up menu, and then click on the speaker button next to each device to which you want the audio transmitted. (Choosing a remote device disables output to your own Mac; if you want to listen on your Mac, as well, just enable it in the list.) You can adjust the relative volume of each device, and the Effects (a.k.a., equalizer) feature lets you tweak the audio signal as it’s sent. Overall, Airfoil is very effective at keeping the output devices synchronized so you don’t get the annoying “echo” effect of two audio signals played with a delay. I did occasionally detect a tiny bit of delay—just a fraction of a second—when simultaneously playing audio through remote devices and the source Mac; however, I was only able to detect it when both devices were in the same room and I was listening intently. In normal listening, I never noticed out-of-sync audio. The first major new feature in Airfoil 3 is the ability to send any audio from your Mac to another computer on your local network—Mac or Windows PC. You do this via a small program called Airfoil Speakers. 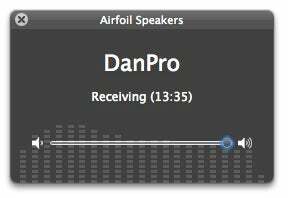 (A copy of Airfoil Speakers for Mac is included with Airfoil, but you can also download the Mac or Windows version, for free, directly from the Rogue Amoeba Web site.) Once you launch Airfoil Speakers on a computer, that computer appears in Airfoil as an output device; enable it and your chosen audio plays through the remote computer. This is a great feature if you’ve already got a computer—for example, a Mac mini or a Windows Media Center PC—connected to your home entertainment system. You can control the volume of the audio sent to the remote computer using AirFoil on your Mac or Airfoil Speakers on the remote computer. The Airfoil Speakers program, which can be set to launch automatically at login, also lets you choose the name that appears in Airfoil for that computer, and it lets you set a password for connecting. On the computer running Airfoil Speakers, a systemwide menu—the program doesn’t appear in the Dock—lets you access the program’s preferences and shows which computer, if any, is sending audio. The second major new feature is Airfoil Video Player, a built-in media player that lets you play a video on your Mac while sending the video’s audio track to remote devices. Although you’ve always been able to play your video in iTunes, QuickTime Player, or another program while sending the audio via Airfoil, audio and video would be out of sync—the video plays immediately on your Mac, whereas the audio has to be processed and sent over the network before being played through the remote device. (A kludgy workaround was to use the de-sync feature of VLC Media Player to delay video playback slightly.) Airfoil Video Player works together with Airfoil to keep the audio and video tracks synchronized. Although not a substitute for a dedicated media player, Airfoil Video Player includes full-screen playback, standard playback controls, a progress/scrub bar, and a time display. You can also choose your audio output device(s) from within the program—you don't have to switch back to Airfoil. In my testing, Airfoil and Video Player worked perfectly at syncing video with remote audio. One aspect of Airfoil Video Player that’s potentially confusing is that you must have an output device enabled in the Airfoil window for the Video Player window to appear. If you don’t, nothing happens when you choose Airfoil Video Player from the source pop-up menu. Also, keep in mind that because Airfoil delays video playback slightly to keep it in sync with transmitted audio, video scrubbing and scanning isn’t as smooth as it would be in iTunes, DVD Player, or QuickTime. Airfoil 3 also has a few minor features that are useful. For example, you can set Airfoil to automatically transmit to particular devices when launched. The Edit: Advanced Source Settings command gives you a number of useful options for handling audio streams. And when transmitting to an Apple TV, your TV displays a new screen (see below) showing a computer and the names of the host computer and program producing the audio being sent. The cool thing here is that the virtual computer’s screen is actually a screenshot of the source computer’s Desktop! And if the computer in question is a laptop or iMac, the computer image will be the actual computer model (a Cinema Display is used for “headless” Macs). Unfortunately, the onscreen display doesn’t show information about what’s being played; for example, it doesn’t show the track name if you’re sending audio from iTunes. Airfoil 3 still has a couple minor limitations mentioned in my reviews of the previous versions. And for the smoothest operation, you'll need to install two additional components: Rogue Amoeba’s Instant Hijack component and the third-party Soundflower Extra. (You'll be asked, the first time you use Airfoil, if you want to install these.) Soundflower Extra is needed if you want Airfoil to be able to transmit System Audio (all your Mac’s audio at once). The Instant Hijack component isn’t required, but if you install it, Airfoil will always be able to stream any program’s audio immediately. If you choose not to install the Instant Hijack component, you’ll need to make sure that before launching the target application, you choose it from Airfoil’s source pop-up menu; otherwise Airfoil will need to relaunch the target program before transmitting. But this is mostly an issue of convenience. Airfoil has long been one of my favorite Mac OS X add-ons, and version 3’s new features make it that much more compelling. To paraphrase my previous reviews, by unleashing AirTunes from iTunes and letting you stream any audio to multiple locations—locations that now include Apple TVs and other computers—Airfoil is a simple and effective option for getting audio around your home. It’s also perhaps the least-expensive way to create a multi-room audio system—especially if you already own several Macs and AirPort Express Base Stations. 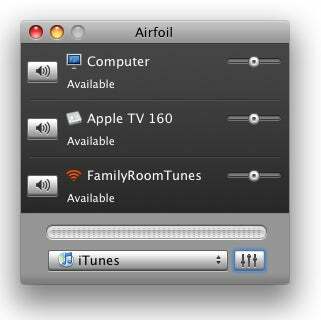 Airfoil 3.1 requires Mac OS X 10.4 or later. A Windows version of Airfoil is also available.